Welcome to a special Paper Piecing Monday. Recently the fabulous Sarah @ nohatsinthehouse set up a wonderful Bee like charity drive called #opgivewarmth. The general idea is that each month Sarah will set a colour palette and each month you can send in a block or blocks to her using any of the colours on the palette. This fabulously trippy star block is a free pattern from Piece by Numbers called Indian Summer. There are two different layouts for this pattern and you can find it at Craftsy. This block is so weird but it is growing on me! 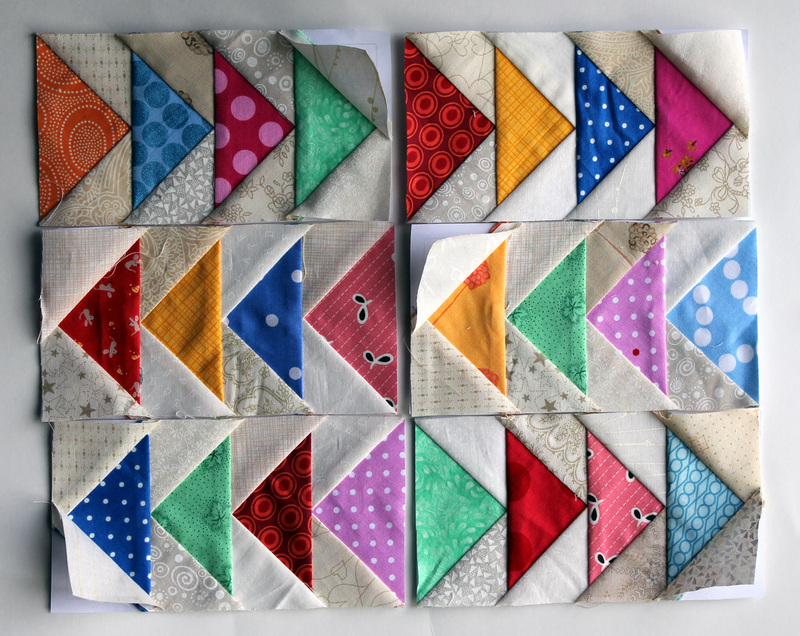 I was going to sew these blocks together to make 6 x 6 blocks but after making a couple of sampler quilts myself I know it is important to have some flexibility with blocks. So I am going to send the flying geese as is, and Sarah can use them as she needs. You can find the pattern for this block at Quilers Cache in a variety of different sizes. 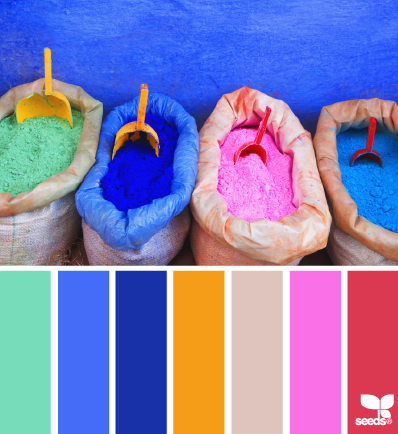 I think the next time I may choose just to use a selection of the colours… but then again I do love a challenge! And if you are a paper piecing fan you should check out Sarah’s work…her quilts regularly make my jaw drop. Hi Alison. I have not done a post on machines… I use a Brother Pacesetter. It is a really basic sewing machine but is pretty heavy duty because I sew nearly every day. I have sewn on a number of machines in the 20+ years I have been quilting, including a whizz bang Janome for a while in the UK. To piece a quilt top you do not need anything too fancy – a lot of people even piece on vintage Singers (I mean really really vintage). It is the quilting where you tend to need a more modern machine… About has a good post on choosing Sewing Machines http://quilting.about.com/od/quiltingthequilt/a/Sewing-Machines-for-Machine-Quilting.htm that asks some good questions about what you may need. My dream machine is a Bernina… but I am happy at the moment with my cheaper Pacesetter. I am using a basic machine myself and the top went together just fine. Now I am trying to machine quilt, even with a walking foot- what a mess. Do most people have a professional do the quilting? I took my machine to my quilting class and it turns out I had a tension issue. It worked allot better for me after that. I also showed your site to our teacher. She loved it. 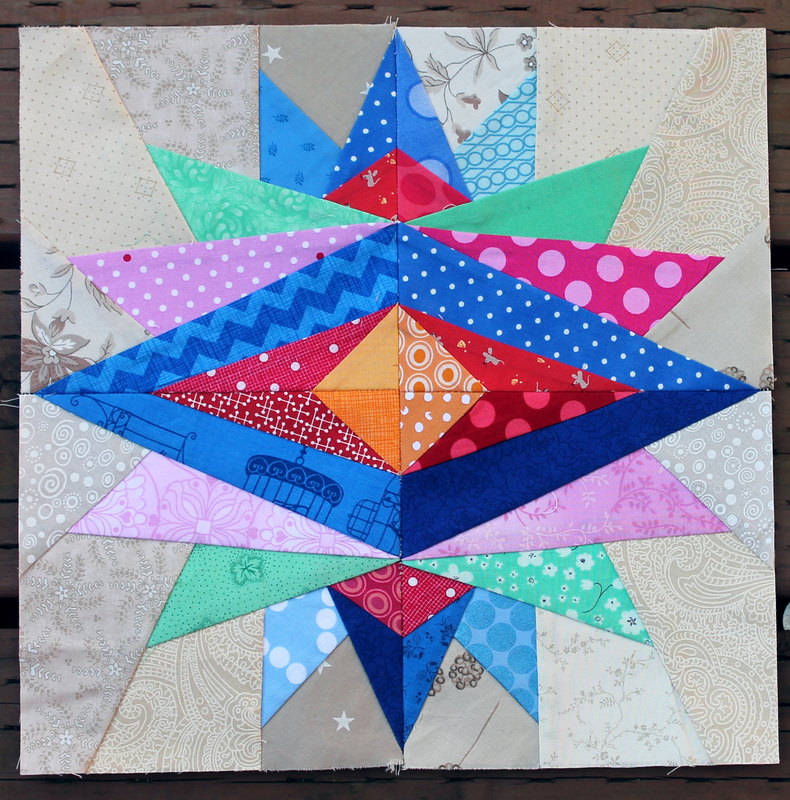 I want to try starry nights paper piecing next. Thank you for you quick response– I was very frustrated with my project, wanting to quit working on it. It gave me the strength to keep going. What a great project – love your take on it!! Thanks Jane. I am now curious who you were commenting on. Lol. Your blocks are lovely! I really must build my LV collection, the results with bright colors is wonderful! I think low volumes are a must, and I am always surprised how much of it I actually have in my stash. My jaw has already dropped today over your block. AMAZZZZZZIING!! I love this idea – will go look at Sarah, who, I admit, is also fabulous! Sarah is a paper piecing Goddess. This block really is crazy but I am slowly warming to it. Your “Indian Summer” block reminded me of an alien ship, coming at me. I hear there’s a Blood Moon tonight. Maybe that’s why I’m thinking of outer space. I loved all the colors together. Oh my! These are all gorgeous! These are beautiful! I love the paper pieced flying geese. I’ve never done them paper pieced, but I love it!!! I agree, the block is growing on me. I do love the way Paper Piecing allows for some wonderful combinations which would drive me insane plain piecing. Beautiful work!! Wow ~ such a bold and beautiful star! 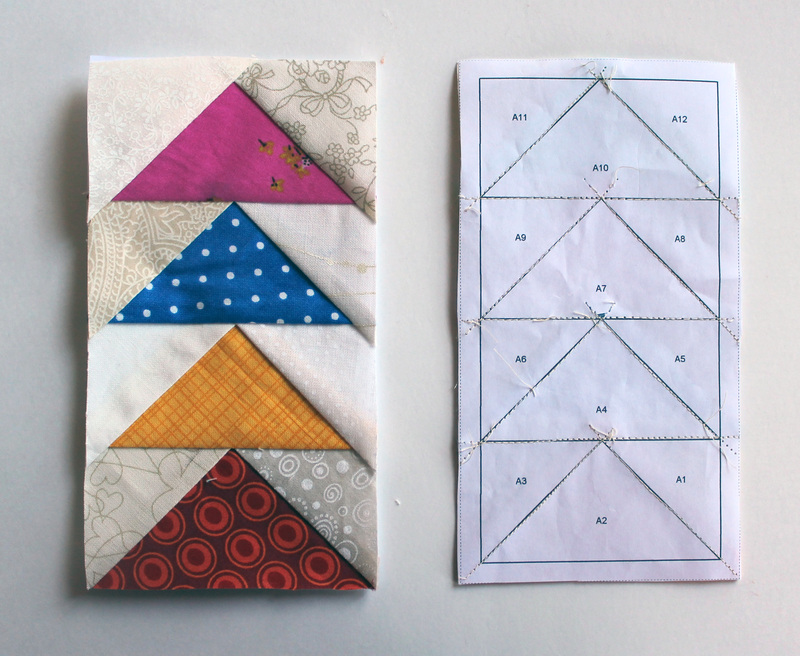 And, thanks so much for the link to the paper pieced flying geese! I love these! And I got to meet Sarah this weekend. She IS pretty impressive. I am so jealous you got to meet Sarah. The Sewdown looked like tip snorting good fun. Wow, love that intricate block! What gorgeous blocks and wonderful color choices! Absolutely lovely! At the risk of beating a dead horse, these are beautiful. And that Indian Summer block turned out spectacular! When I first saw the post on IG, I was thinking you were going the porcupine route or something along those lines. So this literally blew me away when I saw what that turned into :O) Thank you so much for your support. xo. Sarah it was my pleasure. I love this challenge and can not wait till next month. I wrote the post at the start of a bout of flu and realized I did not talk about the idea behind Givewarmth. Next month I will do your idea justice. I like that Indian Summer block, but I think I’d rotate alternate blocks through 90 degrees to give something completely different… gorgeous colours. I’m still suffering from Tropical Colour syndrome, so I’d go with blue, aqua and hot pink! Oh I like your thinking. I look forward to seeing your next quilt. I have a feeling it is going to be bright, loud and very very tropical. I wish! I’m back to the List. Hand quilt Happiness, make Broken Bottles for my lovely sister in law, and then, then, I might indulge myself! Strangely enough, I feel some applique coming on… But nothing at all is going to happen until Saturday, when I pick up my hopefully fully restored sewing machine. Such a great block!!! Love your fabric choices. All the colours was absolutely the right call! I am sure she will appreciate the flexible flying geese too.